Divine is a wide width version of our classic Victorian mid-calf boot with moderate 3 inch heel in ivory. Great for Gothic and Steampunk styles. 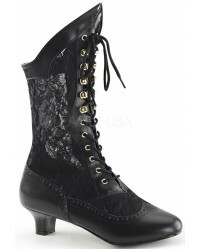 Beautiful for steampunk, Victorian and Bridal, these ankle boots have a lace up front and no zipper. The heel is a moderate 3 inches great for every day. The Divine-115 Victorian Calf High Boot is made in wide width with wide calf, sizes 9-16. Item Number: PL-DIVINE-1050IVPU | Approximate Size (Inches): 12.00 wide x 14.00 deep x 8.00 high | Approximate Shipping Weight: 4.00 lbs.